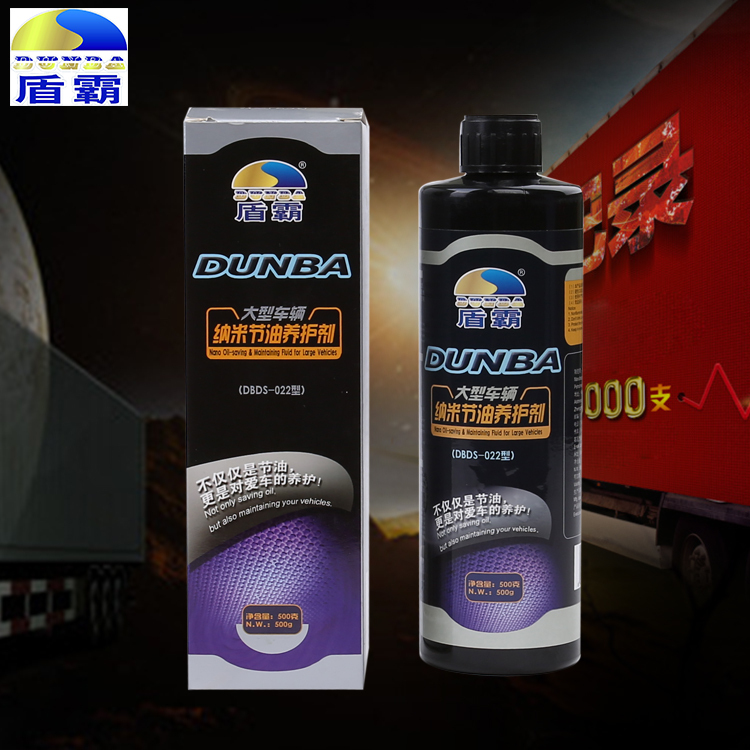 "Dunba NanoFuel-saving & maintaining Fluid for large vehicle" a fuel-savingenvironmental friendly multi-functional lubricant additives made by 2 Nano materialswith anti-wear and self-repair functions, produced by technical equipment with our own intellectual propertyrights (Patent No. ZL200810032849.1) and new scientific and technologicalachievement. 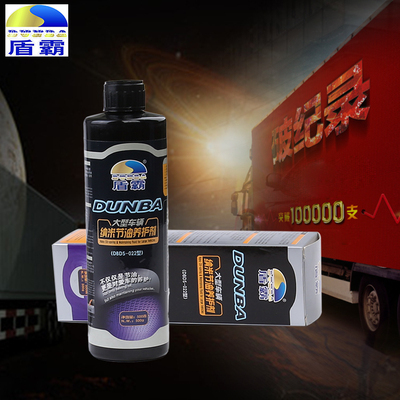 Anti-wear:80%-90% reductions in engine wearand tear, still can provide strong anti-wear protection under lubricationsystem failure and no engine oil condition. Environmentally friendly:improve engine oil burning, blue smoke and other conditions, to reduce exhaust particlesby 20%-30% and smoke emissions by 50%. Fast: engine working environmentimproved in 15 minutes, noise and vibration reduced, and power enhanced. Powerful: triple protection includinginner reinforced, surface repaired and outer anti-wear by Nano-particles. Environmental Friendly:reduceexhaust particles and smoke emissions. No side effects: suitable for long-term useof various vehicles, without any adverse effects or side effects. Multi-functional:fuel-saving, anti-wear, self-repair and maintaining simultaneously. This product can be easily and stably dispersedin all kinds of lubricants, suitable for various lubricant systems of largevehicles, such as passenger cars, trucks and construction vehicles etc.. For those badly worn vehicles run for many years willhave better anti-wear and repair effect. After engine oil change,add the product to engine oil tank, keep the engine idling for around twominutes; or mix the product with engine oil evenly in advance, then add mixedproduct to engine oil tank. Normal usage is about 2.5% ofthe total lubricating oil, in other words, for large vehicle please mix 20liters or 22.2 quarts of lubricating oil with one bottle (17.64oz or 500grams). This product can also be added into gearbox, mixed with gear oil at 2.5% ratio. 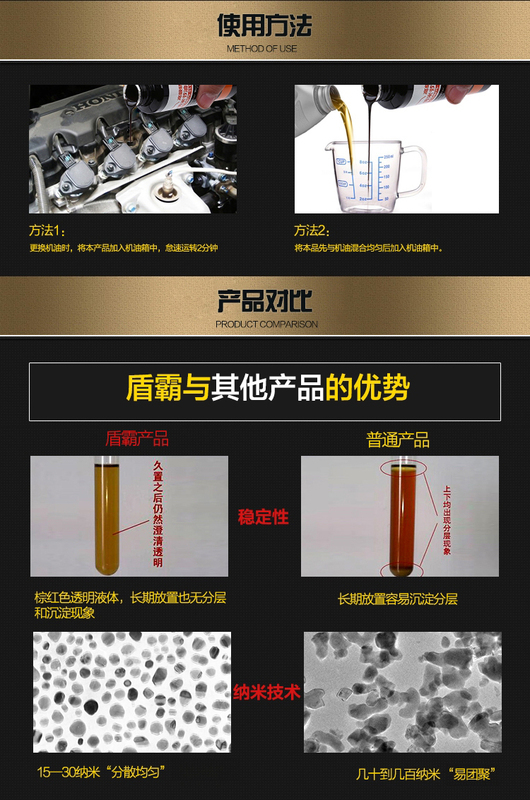 1) If because of piston ring breaking,engine oil leakage due to valve oil seal becoming oil , and other reasons whichresult to serious engine oil burning, blue smoke discharge and other faultphenomenon, then these are not included in repairing scope of this product. Wesuggest customers repairing your vehicles, after that use this product.